A lot of combined factors have negatively affected Canadian stocks lately. Successive interest rate hikes by the Bank of Canada, NAFTA negotiations, US driven commercial tensions, etc. Even though our economy is doing quite well and has somewhat shifted away from its oil dependency, we still rely a lot on resources and their volatile nature on the markets. What the US does also has great influence on Canadians. Unfortunately, to some extent, we are at the mercy of its vocal leader. NAFTA talks finally concluded after the US made little concessions and even managed to rename the agreement that will now be known as the United States, Mexico, Canada agreement (USMCA). All this while the noisy Washington chief remained quite disrespectful, negotiated in public and nearly laughed right in our face. We are not convinced, but let’s hope we have seen the worst of US-Canadian relations. Earlier this year, we had Utilities Stocks on Our Radar and acted on it. A few months after the fact, piling up on utilities may not appear like a wise decision as those stocks are really sluggish as of late. But we are not than worried as we are still convinced it will turn out to be a smart long-term choice. In practice, many stocks often struggle short-term after you acquire them. This will be especially true if you try to buy stocks when they dip like we do. Many times, they will continue to go down a little before getting back up. The important matter is to choose solid corporations that will do well in the long run. After that, you have to remain patient and sell only if you realize your initial investment assumptions are not true or are reversed somehow. That kind of selling should be quite rare. Particularly if you take a little time to do some basic research and analyze robustness of your stock candidates in the first place. So, don’t worry that much about those utilities, they will eventually come around and slowly climb up again. In the actual context, many battered-down Canadian stocks constitute very interesting buying opportunities. Take your time to research and detect the more robust ones. 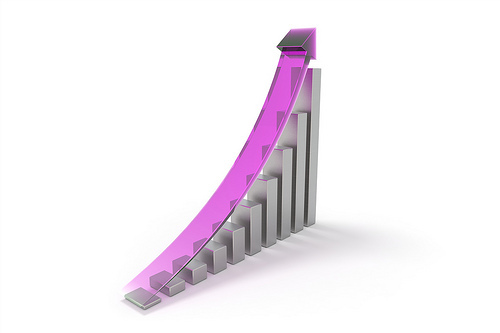 If you acquire them now, expect they could dip a little more (and even maybe a lot more) before eventually going back up. 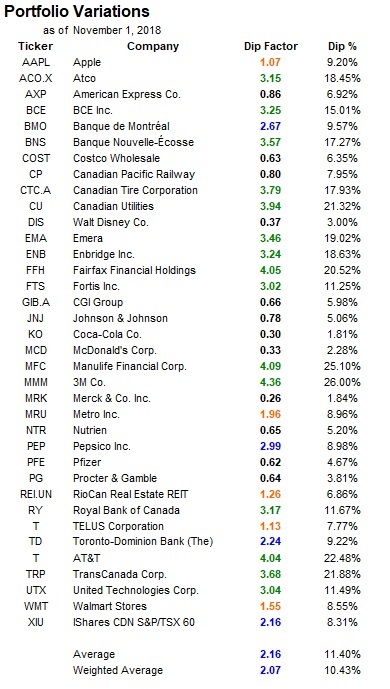 Many specific examples of dipping Canadian stocks appear in our existing positions with appealing Dip Factor. We particularly like Royal Bank (RY Down 11.67% Dip Factor 3.17) but would probably still wait a bit to pull the trigger on it. With all utilities stocks dipping, our favourite is undoubtedly Emera (EMA Down 19.02% Dip Factor 3.46) as we talked a couple of times before. 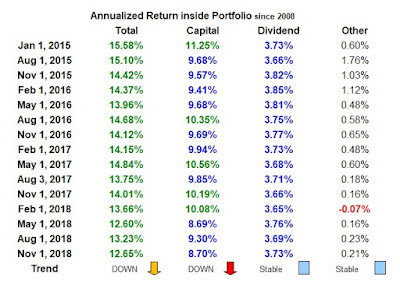 We have been in an almost continuous bull market for about the last 10 years. And, after that current amazing market run, you have to expect a severe decline at some point, but you never know exactly when it will happen. Moreover, despite several hard-decline days lately, we probably have not seen the worst. So, all investors should be prepared for some kind of shock. A few weeks back, a friend reminded us how we used to view short-term market noise. In fact, we still believe sharp short-term declines are only a minor glitch in the long term. Especially in recent time, viewing stocks or markets using daily, weekly, monthly or even yearly charts can be really frightening. Taking a step back and looking at things from a broader perspective is the trick. With a chart or horizon of at less 10 years, any major short-term setbacks will only appear as minor abnormalities in the long run. In a previous post, we talked about how we like Handling Bad Decline Days. To resume our motto in those circumstances, we simply stay calm and look for buying opportunities. 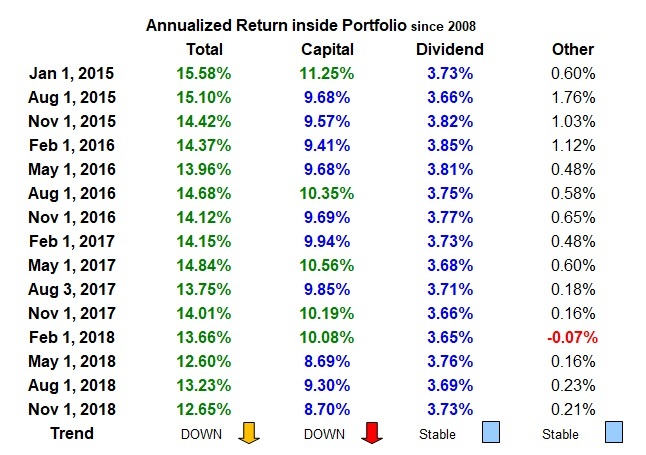 These days, we like to remind ourselves our long-term performance is and still will be, quite good. Even though it will still be a little painful, we also try to psychologically prepare for the eventual yet inevitable stock-market-crash trauma. This process is all part of having success and making decent money with stocks in the long run. Several sectors have been very trendy as of late. Just think about all the hype surrounding bitcoins in the last few years, the recent legalisation of cannabis in Canada or to a less extent, the resurgence of tech stocks. Many novice investors or even more experienced ones seem to be easily attracted to these in vogue sectors and their corresponding stocks. A lot of people are seduced by the possibilities of getting rich quick and in the end, it may be a large part of the explanation of why many lose money with stocks. They get interested by the latest cool thing but it’s often too late to even have a chance to make money or even not to lose money with it. Unfortunately, it’s almost guaranteed you will lose money with these so-called exciting stocks. Lucky for us, we like boring stocks better. With our conservative investing style, we won’t even consider extremely volatile bitcoins or pot stocks. We still will be inclined to risk a little with tech stocks from time to time like our current position in Apple (AAPL). But overall, our tech exposure will always remain limited. Like it’s often the case with popular stocks, everyone seems to be getting into them after they’ve already surged. Tech stocks are a good example right now. In those circumstances, our reaction, quite opposite, will always be to remain careful and consider it’s probably time to get out of them. This time around, we remain confident and won’t get out of Apple as of yet but certainly won’t acquire additional shares for some time. Getting back to the boring stuff, last time, we talked about how we may have missed an opportunity earlier this year with Colgate-Palmolive (CL). But often in life, things or events happen for a reason. For a while, we had been instinctively quite high on CL but got worried when we took a deeper look. CL may be too boring as its growth stagnated in the last few years. CL is certainly not falling but it may not be growing anymore. Its questionable Dip Factor over 4 also merits some additional research and digging. Like many corporations in its sector, CL seems to have problems with online competition from fierce new smaller players. We initially thought CL strong brands and its sales supported by major retailers like Walmart would be sufficient to fuel its continuing success. It may not be the case anymore as competitors like Procter & Gamble (PG) now look much better and seemed to have surpassed the same hurdles. Again, compared to PG, CL brands may also not be numerous and diversified enough. Colgate and Palmolive are two major household names, but it kind of stops there after that. Try to be good until next time!